Whenever we start to think about other plants and flower families reaching the top of the botanical beauty pyramid, the Rose family comes back to remind us who’s really sitting pretty at the top. Though Jasmine is regal, Ylang Ylang is fantastic and Blue Tansy is simply stunning, none of them compare to what the wide and magical Rose family has to offer. Beauty, happiness, meditation and calm are all fed and nourished by Rose’s sweet bright essence. Among these Rose variations is Rockrose, our more woody, deep and rich Rose essential oil offering. Working with RainShadow Labs will enable you to create your own formula utilizing this deeply fragrant and warm essential oil. Rockrose—similar to other essential oils, like Frankincense and Myrrh—has a history of being used as a spiritual and meditative aid. It grows on a shrub native to the Mediterranean region of the world and was used in Ancient Egypt as incense and a perfume. In fact, the Rockrose plant waas so revered the false beards of the pharaohs were steeped in the resin of the Rockrose. While most Rose oils have a rather light and strongly floral aroma, Rockrose is deeper with notes of amber and leather to round out the sweetness and slight spice of what we all have come to associate with Rose. It is a fabulous oil to use for help when it comes to meditation and relaxation and makes a fine addition to other rituals and events with a ceremonial quality to them. It would make an absolutely fantastic addition to private label scent blends for perfume use as well as to add to private label skincare products. 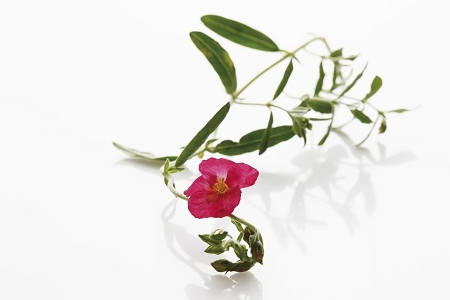 In skin care, rockrose is used for calm, toned, tight, young and smooth skincare purposes. It is absolutely divine in anti-aging private label skincare aiming to be effective while also making the person using it feel like royalty. And its calm-inducing properties in aromatherapy make it a fun way to help combat stress. Essential oils aren’t exclusive, meaning you can use more than one at a time or even combine them through our private label custom manufacturing program. As a matter of fact, combining different oils can actually create a unique synergy where each oil bolsters the effects of the others. For example, you could combine rockrose with lavender and helichrysum for an amazing anti aging skincare oil that can help with wrinkles, fine lines, sagging and the general signs of aging. Or, you could mix it with frankincense for a meditation aid. Whether you want a stand out botanical perfume, your private label skincare products to be exceptional in both aroma and product efficacy, or you simply enjoy using and learning about essential oils, don’t let the power, beauty, and mystique of Rockrose pass you by. There are many companies that sell essential oils, and it can get confusing trying to find the best one. Some important things to look for are transparency regarding ingredient sourcing and production. If they offer samples, take advantage! Your nose will tell you if it’s good or not! Contact us now to learn more about our essential oil, private label program or to request your own sniffing sample of rockrose essential oil.